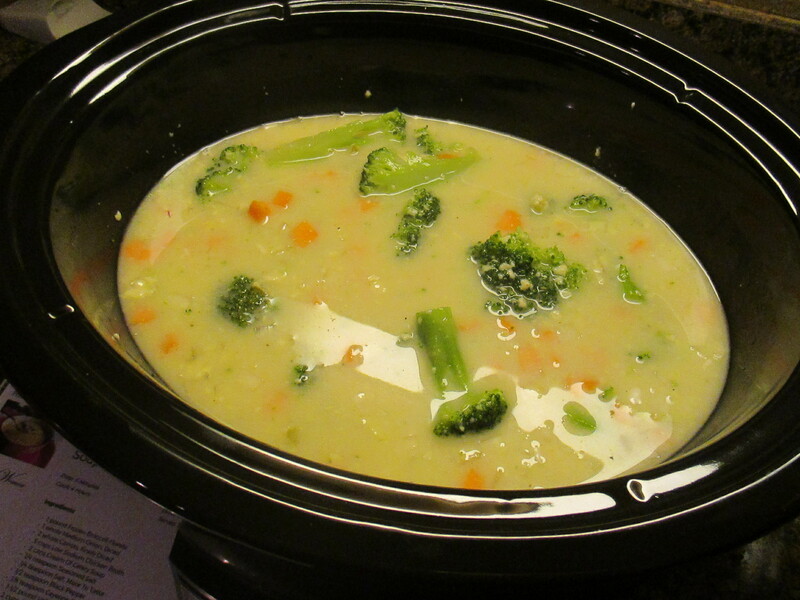 Whenever I go to Panera and I am in the mood for soup I always get the Broccoli Cheddar Soup. I am not sure what drew me to ordering the soup in the first place, because when you think about it, you would assume that a cheddar soup might be thick and overly cheesy… More like a cheese dip as opposed to a soup. But thankfully that is not the case. Wanting to create the soup at home I came across The Pioneer Woman’s recipe that utilized one of my favorite kitchen appliances… a slow cooker. And thankfully she believes in what I do, using your slow cooker shouldn’t require too much fuss; it really should be about throwing it all in there and forgetting about it for a few hours. The only prep work I had to do was chopping up a few carrots and an onion. Which I added to my slow cooker along with cream of celery soup, chicken broth, broccoli florets, salt, black and cayenne pepper. After giving it a few good stirs I cooked it on high for 4 hours. After 4 hours I used an immersion blender to puree the soup. Next I added in Velveeta and shredded cheddar cheese. I had never used Velveeta in anything prior to this – I am not even sure I have ever had it either – so, I was a little shocked by how much it cost. How could a process cheese product cost more than some basic cheeses? Insane! After adding the cheeses I covered the soup again and cooked it on low for 15 minutes. I should note that I never turned off my slow cooker during the pureeing and adding of cheeses, I left it on the warm setting throughout. After the 15 minutes I gave the soup a few good stirs to mix in the cheeses and that was it! 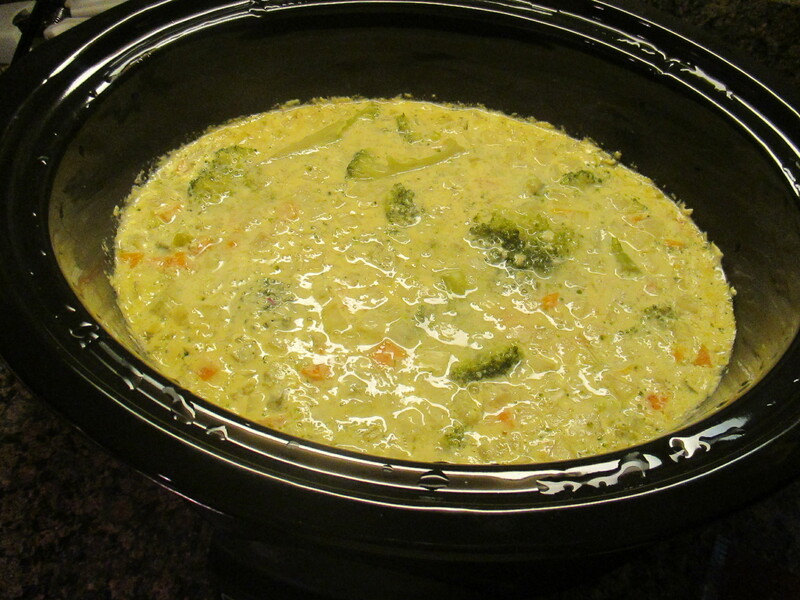 Definitely a quick, easy and delicious slow cooker recipe! 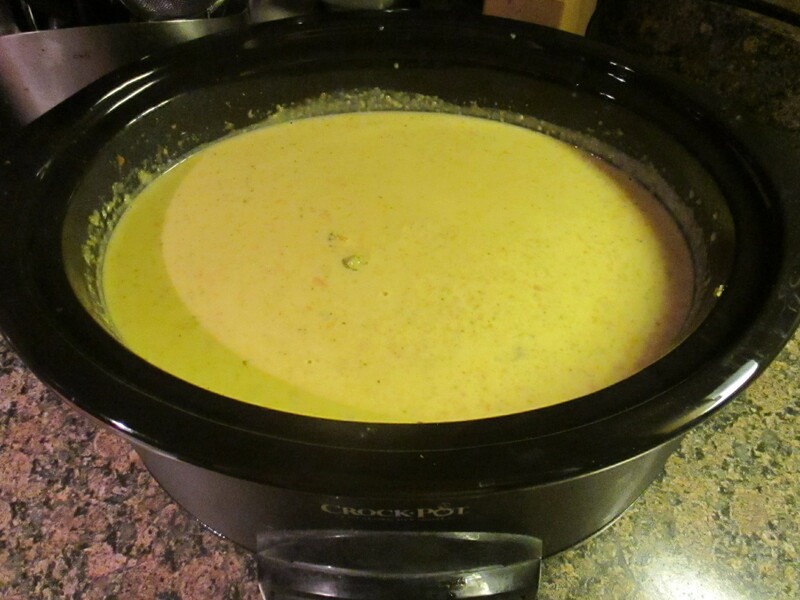 Add all the ingredients to the slow cooker except for the Velveeta and cheddar cheese. Stir, cover and cook on high for 4 hours. After the 4 hours use and immersion blender to blend 3/4 of the soup. You can also use a blender; if doing so only blend 1 cup of soup at a time. 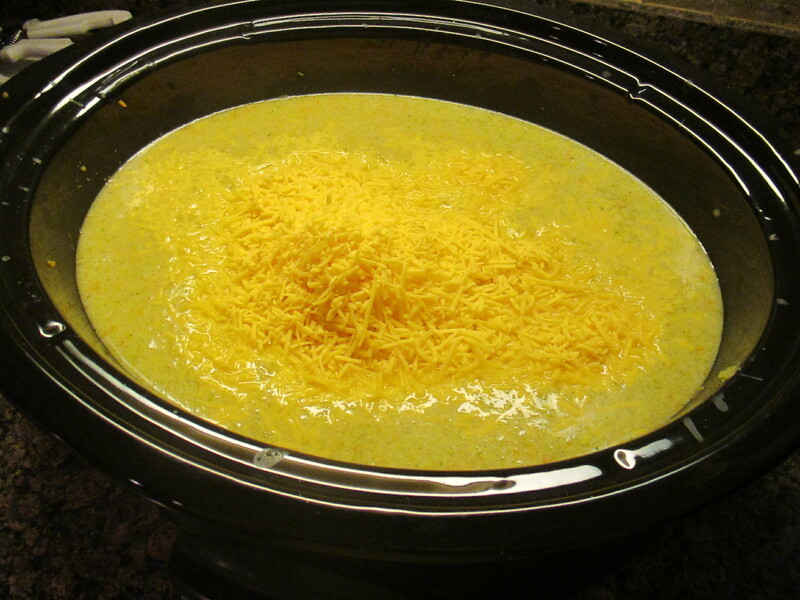 Add the cheeses and turn the slow cooker to low and cook covered for 15 minutes. After the 15 minutes stir the soup to melt the cheese and mix it in. Add more salt and pepper if necessary. Soup will keep in the fridge for a few days.